Our cheeks are generally at their most voluminous and smooth when we are babies, and after that they start deflating! A young-looking face can be compared to an egg, with the narrower part of the egg pointing down. As we get older the egg will start to turn upside down (with the smaller portion of the egg being at the top and fatter end at our jowls). This is because over time we gradually lose facial volume, our skin becomes thinner and the effects of gravity can become apparent. Restoring the soft tissues of the face by adding volume is increasingly becoming a corner-stone of facial rejuvenation science, and Facial Fillers are the most effective treatment for the mid-face and cheekbone areas. The objective of treatment is to replace or enhance facial volume and restore the youthful contours of the face. For some, who are looking for a more permanent solution, surgical implants or fat injections can be done. But, this does require the downtime to recover from surgery and as you age, the implant may not look as natural as your face changes its shape and contours. There is a large variety of Facial Fillers available for facial contouring. At Skin MD and Beyond, our doctors’ preference and most popular filler used for cheek enhancement is to use VOLUMA. In comparison to other available products, Voluma is a hyaluronic acid, similar to Juvederm, Restylane, and Perlane. But unlike the latter products, Voluma’s formulation is more stable and the most “sculptural” filler as it is elastic and is not “stiff” and when it is injected over the cheekbones it is more effective at creating a very nice elevation and lift of the tissues. Sculptra and Radiesse can also be placed in the cheeks but the downside to these two latter products is that they are not reversible (if you don’t like the look you are stuck with it) and they do not have the same “lifting” potential. Sculptra is made of poly-l-lactic acid particles which stimulate collagen formation and has been used for cheek enhancement. Sculptra is not effective for “lifting” skin and is more often used for general (less precise) volumization of the facial areas from the cheek to the jawline to correct shallow to deep smile lines (nasolabial fold) contour deficiencies and other facial wrinkles. Radiesse is a much “stiffer” product and when used in the cheeks it can create more prominent harder angles which may require additional filler to “soften” the contours. Cheek Augmentation is an effective, non-surgical, and minimally invasive option for those who wish to have more volume in the cheekbone area and enhance their overall facial contour and balance. Cheek augmentation using Fillers is a very popular treatment as it delivers a two-fold advantage. First, the flattened cheek area is raised to a more youthful position. (Unfortunately cheek flattening is something that happens to all of as we age, partly due to some natural bone loss and partly due to facial fat loss). The second positive aspect is that this lifting also enhances the contour and youthfulness around the eyes. Rebalancing the flatness or lack of volume in the cheeks with facial fillers is one of the best ways to take several years off your appearance! By changing the shape of the face back towards a lifted, less flat cheekbone look, you will restore a more youthful and energized balance to your face. Not all injectors are created equal so you need to do your research with finding someone who not only can inject, but has and an artistic eye and a lot of experience with facial contouring. Drs. Wright will perform a personal consult with you first, to decide on what look you are wanting – if you want volume, lift or both! Like and artist with a paint brush, our doctors will then choose the best filler to get the best effect in the various areas of your face. Whether you’re 35 and just beginning to see the first signs of aging, or 55 with skin that isn’t exactly keeping your birthday a secret, seeking ways to reduce facial lines and wrinkles is probably on your agenda. Facial Lines are created for various reasons, and when you know the cause – you can choose the right treatment to get you the best results! Fine lines and subtle textural changes can be treated with Microdermabrasion, DermaSweeps, and superficial Chemical Peels. These procedures have minimal downtime and are great for “maintenance” management. Deeper more etched lines and surface irregularities are best corrected with Laser Resurfacing, MicroNeedling and medium-to-deep Chemical Peels. When lines become wrinkles and folds, then Facial Fillers are the best answer to improve your appearance! Around age 40, you cross that line — your collagen and elastic tissue have experienced enough damage to really start showing a change. You look in the mirror, and uh-oh, you can no longer ignore it or easily cover it up. Protecting your skin year-round will help prevent you from further accelerating your age. Studies have shown the following ingredients can reduce wrinkles. Most are found in a variety of skin-care treatments, both prescription, over-the-counter, and with Fiona WRxIGHT MD Skincare. To purchase any of the listed products, shop at www.RxBeautyBar.com and start your youthful transformation today! Alpha-hydroxy acids (AHAs): These natural fruit acids lift away the top layer of dead skin cell, and can reduce the appearance of fine lines and wrinkles, particularly around the eyes. New evidence shows that in higher concentrations, AHAs may help stimulate collagen production. Retinoids (Vitamin A): The only FDA-approved topical treatment for wrinkles is tretinoin, known commercially as Retin A, and though it is effective it can be unbearably irritating for sensitive and normal skin types. Retinol is a natural form of vitamin A found in many over-the-counter products. Studies show that in a stabilized formula, in high concentrations, it may be as effective as Retin A, without the side effects, such as skin burning, redness and flaking. Topical vitamin C: Studies at Tulane University, among others, have found that topical Vitamin C can increase collagen production, protect against damage from UVA and UVB rays, correct pigmentation problems, and improve inflammatory skin conditions. Idebenone. This chemical cousin to the nutrient coenzyme Q10 (CoQ10) is a super-powerful antioxidant. In one study published recently in the Journal of Dermatology, doctors found that with just 6 weeks of topical use, there was a 26% reduction in skin roughness and dryness, a 37% increase in hydration, a 29% decrease in lines and wrinkles, and a 33% overall improvement in sun-damaged skin. Other studies have found similar results. Microdermabrasion and DermaSweeps are skin restoration procedures that aim to produce smoother, clearer and younger looking skin. It is also used for skin problems such as acne, blackheads/whiteheads, sun damage and fine lines. Both treatments are painless and the results can be seen in just one visit! There should be no side effects and no “down time” for recovery. Microdermabrasion treatment involves using a highly controlled flow of fine, medical grade crystals to exfoliate the dead, outermost layer of skin – while a controlled vacuum gently removes the debris. This skin exfoliation process reveals the new, living cells that are soft, smooth and receptive to nutrients. The procedure is performed using a hand piece that the aesthetician passes over the skin. This evenly removes the stratum corneum, the outermost layer of skin. At the same time the underlying epidermis is also stimulated by the abrasion and the vacuum. This promotes new collagen which thickens the dermis and improves resistance to ageing. As featured in Elle Magazine, DermaSweep-MD is a third generation microdermabrasion that is only available through your physician. This innovative treatment does not use crystal particles or abrasive diamond tips. Instead, it uses patented bristle tips to exfoliate away skin layers to reveal new healthy skin underneath. Your treatment can also be further customized with the addition of Epi-Fusion Serums which are skin specific treatment solutions. There are several types of Chemical Peels available and they come in varying strengths, and formulations. They can be used to treat a number of conditions such as acne (including acne scarring), fine lines, wrinkles and sun damage. Chemical Peels are designed to improve and smooth the texture of the skin by removing the dead skin cells. After treatment, the new regenerated skin is smoother, fresher, more radiant and appears less wrinkled. The type of skin peel used is determined by skin type and problem areas, and an experienced physician will be able to suggest the best peel in order to get optimum results. As with all aesthetic treatments, Chemical Peels should only ever be administered by a trained, qualified professional and should only be used within a clinical environment to ensure a safe application and a good result. At Skin MD and Beyond we offer various levels of laser treatments to resurface your skin, to ensure you get the best results. Laser resurfacing can repair skin damage, reduce wrinkles and fine lines, and lessen the severity of skin irregularities like acne scars, blemishes, enlarged pores, and uneven skin tone. Lasers can work by gently removing the top damaged and discolored layers of skin and allow healthier skin to rise to the surface. When the skin heals, new collagen is formed which will create a smoother surface. The ReSurFX Laser is the newest fractional laser treatment, which unlike other devices, is the only true fractional non-ablative technology which requires only one pass over the skin to effectively treat scars. Why is this important? As a National Expert Panel Advisor on the ResurFX Laser, Dr. Wright will educate physicians that typical lasers deliver energy in a standard pattern that requires multiple passes which can overheat the skin very quickly causing burns and hyperpigmentation. In addition, the very advanced ResurFX scanning pattern, allows our doctor to choose from more than 600 combinations of shape, size, density and energy strength for a highly customizable treatment to fit each patient’s precise needs. No other laser has this ability. which stimulates the skin to regenerate and repair itself naturally and safely, creating smoother, brighter, healthier and younger looking skin. It is an excellent treatment for the face to reduce and eliminate wrinkles and scar tissue, hyperpigmentation, sun damage and signs of ageing. skin a smoother, brighter, healthier and more ‘plumped out’ look. Facial Fillers can be used to treat fine lines and wrinkles with no downtime! As you age, the years of laughing, smiling, talking and tanning inevitably creates creases in your skin. Over time, these lines etch in permanently and are there even when the person is not smiling. By injecting fillers under the surface of your skin, it can effectively restore the natural youthful looking contours of your face, smoothing wrinkles and filling in lines. The most appropriate lines to treat with Juvederm and Restylane are those that are described as static – the lines you can see when your face is still. With Belotero, very fine lines around the eyes and cheeks can be reduced without lumpiness. Facial Fillers work extremely well to remove wrinkles and deeper folds known as the nasolabial folds that are a result of lost facial volume that occurs as we age. With this volume loss the skin begins to “fall down” and etched lines get deeper – creating a fatigued and saddened appearance. With proper placement, fillers such as Juvéderm, Restylane, Perlane and Radiesse can result in significant reduction of the folds creating a more rested, youthful and less tired appearance. Botox can give you Cheekbones! While a strong, square jawline can be distinctly masculine and desirable in male patients, many female patients are seeking a softer more feminized shape to their face. Botox Jaw Reduction is a specialized technique to reduce the width of the jawline changing an overly square jawline to a more attractive oval or heart shaped face. By injecting the masseter muscle (the muscle located below the cheekbone) it will thin/soften the jawline and will accentuate your cheekbone contour – without creating the fullness that cheekbone fillers can cause. The treatment area is located at the angle of the jawline, near the ears. Particularly in Asian females, changing the shape of the face from square to a more attractive oval shape can add a more gentle graceful appearance, and this very skilled technique has been highly sought after within the Asian population due to its specific cultural preference. In some patients, the masseter muscle, a chewing muscle, is enlarged creating extra facial width. Botox selectively weakens this muscle over time leading to an overall reduction in the size of this muscle. This procedure is best for younger patients, in their twenties and thirties, without laxity of the skin. As you age, reducing the size of the muscle may cause more jowl as the muscle tone is needed to hold the skin taut. This procedure should only be performed by the highly experienced injectors as improper placement can cause some muscle weakness in the lip area, which can affect the smile. Hyperpigmentation of the skin can cause uneven color and dark patches. Excessive production of melanin is responsible for this condition. Hyperpigmentation can occur on almost any part of the body, but is most concerning when it is on the cheek area. Multiple topical modalities can be used, and combination topical therapies are the current first-line approach. The most commonly use skin care to treat pigmentation are Hydroquinone (2-4%), Retinoic Acid, Azelaic Acid, Niacinamide and Kojic Acid. Individually these ingredients need to be in high concentrations to be effective and can be quite irritating to the skin. To solve this problem Fiona WRxIGHT MD Skincare formulated Radiance, a non-irritating, hypoallergenic medical blend of the most potent skin lighteners to dissolve and help block the formation of pigmentation. Designed to gently resurface the skin, Radiance will help to correct early environmental skin damage and pigmentation, create clear pores, even skin tone, and smooth texture to create the most youthful radiant you. Photofacial- IPL (Intense Pulsed Light) technology is a treatment breakthrough that can correct a variety of facial skin imperfections such as skin discoloration, age spots, freckles, mottled pigmentation. The same treatment can be used effectively on the neck, chest and hands. It offers a safe, non-invasive solution that can be tailored to your individual concerns and skin type, providing superior cosmetic results and outstanding satisfaction. After researching different IPL devices, over many years, Dr. Wright discovered the Lumenis M22 IPL to be the best because the results are predictably excellent. This machine suits all of our clients needs and gives the results promised. Lumenis M22 offers three outstanding features that make it one of the most effective sun damage removal and pigmentation systems to date. A refrigerated handpiece and patented cooling gel, which allows maximum energy delivered with minimum discomfort. The handpiece can be recalibrated daily, which means you get the same amount of energy delivery for the entire life of the handpiece. With its OPT technology, exclusive to Lumenis IPL, it provides the optimum choices to deliver the appropriate pulse for any application. Dr. Wright is able to control the pulse shape of the light in order to allow the best results and reduce the chances of skin damage in lesion treatment. Chemical Peels can be specifically designed to treat the superficial or deeper layers of the skin, with the deeper treatments creating better results but also having more surface inflammation and irritation. people worry about. In modern life, sun-damage and air pollution – particularly cigarette smoke – causes the skin to thicken and become dull from a build-up of dead skin cells. Chemical Peels are an excellent treatment to exfoliate dead skin and leave healthy skin below to glow! Skin peels are very safe. However, like any treatment there are contra-indications and a small risk of complications. Therefore at Skin MD and Beyond, all clients have a comprehensive consultation which they can discuss the treatment and any questions that might arise. For those who may not want the down time of a medium-to-deep peel, many people combine their skin peel with Microdermabrasion or DermaSweep to achieve optimal results. ResurFX Laser Skin Resurfacing, (as mentioned above under for the treatment of Fine Lines and Wrinkles) is uniquely designed to allow the ability to treat microscopically small treatment zones surrounded by untreated areas for very rapid healing and dramatic results. Early signs of aging – such as wrinkles, discolorations, and scars can be corrected with ResurFX® laser skin resurfacing. The ResurFX laser treatment also encourages collagen production, filling fine lines and wrinkles while creating a healthier, more vibrant appearance. Optimal results are achieved with five treatments about four weeks apart. 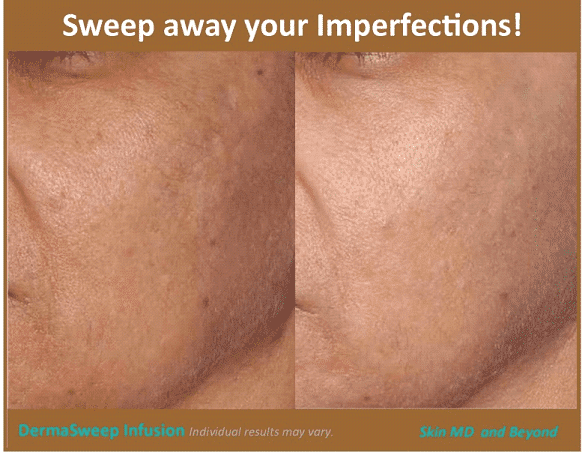 Microdermabrasion and DermaSweep Dermal Infusion Treatments, (as mentioned above under for the treatment of Fine Lines and Wrinkles) are an excellent treatment to improve the texture and quality of your skin. The precision hand piece of both procedures is passed over the face to loosen and remove the upper layer of dead skin cells. With a series of treatments, you will see the skin benefits as it tackles dull, dry or rough skin, treating acne and reducing superficial pigmentation and fine lines. These treatments are commonly used in combination with other treatments, including peels, wrinkle reduction and prevention and volume enhancement. Following treatment, your skin will be brighter, smoother and softer to touch. Over the years the cheeks receive a lot of environmental damage and are at risk for various skin concerns. Some may be a consequence of aging, while others are due to acne/oil production and sun exposure. It is important to not self-diagnose, and seek the professional opinion of a skin care specialist. Some concerns may be very innocent (skin tags, milia, seborrheic keratosis, warts) and can be removed for cosmetic reasons only. See information at Forehead: Lumps, Bumps and Moles. Sun-damage is the most common skin problem in Texas and pre-cancerous spots (actinic keratoses) are a major feature of this. There are some excellent modern treatments now available. In particular lasers and light treatments are able to treat broad areas of diffuse actinic keratoses and sun damage with superior cosmetic outcome than previously possible. While others, if suspicious, will require an excision biopsy or a punch biopsy. Suspicious, dysplastic or cancerous lesions are not suitable for laser. Histology is required, so either part of the lesion, or the entire lesion need to be cut out and sent to pathology for examination. Two non-cancerous skin conditions which commonly occur on the cheeks and have an embarrassing social stigma are Seborrheic Keratosis and Dermatosis Papulosa Nigra. While both have no medical consequence, they both have a real cosmetic concern for patients. With the availability of traditional and cosmetic dermatology devices at Skin MD and Beyond, Dr. Wright can successfully treat and eliminate these concerns. So, if you suffer from these unsightly skin condition then we welcome you to make a consultation at Skin MD and Beyond and discuss the various treatment options with Dr. Wright. With over 18 years’ experience in treating Skin, Facial Rejuvenation and Cosmetic Medicine, she has developed a treatment protocol that can effectively deal with your concerns. How do we treat Dermatosis Papulosa Nigra and Seborrheic Keratosis? Seborrheic Keratosis are flat-topped or warty-looking lesion that appears to be ‘stuck on’ to the skin. They are usually pigmented, sometimes deeply and may even be black. Others can be paler in color. The surface is usually pitted and irregular with visible keratin dots giving a granular and rough appearance. They tend to have a well-defined border. They tend to start in middle age and to stick around for the remainder of life. A study of people 64 and older in North Carolina, found that 88% had at least one seborrheic keratosis, and of the population involved 38% of white women, 54% of white men, and 61% of black men and women had at least 10 of these ugly marks, usually on sun-exposed skin. Over time, they can enlarge and become plaques. Dermatosis Papulosa Nigra occurs in about 35% of black persons and is also relatively common in Asians. It usually begins in adolescence, appearing first as minute, round, skin-colored or hyperpigmented macules or papules that develop singly or in sparse numbers on the cheek below the eyes. The lesions increase in number and size over time, so that over the course of years the patient may have hundreds of lesions. They closely simulate seborrheic keratosis, and many believe it be a form of seborrheic keratosis. Treatment is made difficult by the tendency for the development of dyspigmentation. Light curettage, superficial liquid nitrogen and light electrodesiccation are effective, but may result in hyper- or hypopigmentation. Aggressive treatment should be avoided to minimize irregular pigmentation and scarring.